Our courier case has rigid side panels to keep contents flat. 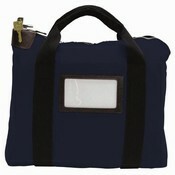 Maximum security 7-pin lock and pick-resistant zipper secure contents. Durability is created by the wear-resistant 1000 Denier fabric and double-stitched seams. Wrap-around webbing supports full bag weight, and tapered handles provide carrying comfort. Silk screen imprint included (one color/one side). Includes I.D. window and address card. Please allow 3-5 weeks for delivery.